Steve Gill speaks at the Castleford Tigers Supporters Club Meet the Directors Evening. A full house greeted the guests for the 13th meet the directors evening organised by Castleford Tigers Supporters Club, which took place in the Riverside Signs and Designs Restaurant. Guests at the Black Swan, Normanton sponsored event included Jon Wells, who was welcomed back to the club, as well as directors Ian Fulton, Steve Gill, Mark Grattan, Steve Vause, Dion Lowe and John Duff. Also in attendance were Michelle Cooper (media and marketing), Craig Jeffels (commercial), Stuart Vause (groundsman), Andy Lynch (player welfare) and Chris Powell (bars). Steve Gill explained his decision to stand down as chief executive in May and said he was looking forward to watching Cas without pressure and helping Jon Wells who he had known since Jon’s junior days. 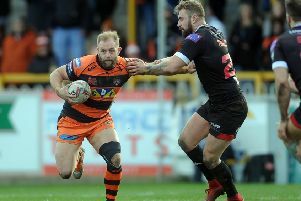 He wanted to set the record straight about various rumours that had been circulating, saying Daryl Powell signed all the players for the club and he had not had a fight with the head coach. Steve clarified the position on Zak Hardaker, saying he had been dismissed by the club and it had been a board decision. The club found him a job with a sponsor and in January offered him a new contract, but he refused it and is now open to offers from other clubs. On the issue of youth development, Steve said that head of youth Pete Riding was not being replaced at the moment, with Darren Higgins doing a similar role at present. Part of Jon Wells’ role will be reviewing the youth structure. Mark Grattan, who will take over as managing director, gave a summary of the 2017 financial results with attendances and advertising up 30 per cent and income from bars up 60 per cent. He went on to say that the Tigers have halved the turnover gap to the big four teams in 2017 and that the club is in a good financial position. Jon Wells, who is the new director of rugby, thanked Steve Gill for doing an outstanding job and went on to explain his new role at Cas where he will work alongside Daryl Powell, Steve Gill and the board, looking after football matters from the boot room up to the boardroom. His aim is to provide a vital link to identify players and assist with the transition of young players through the system. Jon stressed that winning silverware was a top priority and cementing the club’s place as a top four club. Chairman Ian Fulton who also thanked Steve Gill for carrying out a difficult job with honesty and integrity, welcomed Jon Wells to the club and was sure that he would take the club to the next level. On news on the new ground, Ian Fulton said all updates would be on the Axiom website and social media sites. The developer was in the process of signing up companies for the retail park and work on the site was due to start soon, with everything progressing well. The rest of the directors, Jon Duff, Steve Vause and Dion Lowe were asked for comments, and all were happy with the position of the club. Steve Vause raised the issue of the abuse of club directors and their families on social media, saying it was disgusting and damaging to the club. After a break the members of the Tigers staff present were introduced to the supporters. Chris Powell explained his role in charge of all the bars at the ground, while Michelle Cooper, from the media and marketing team, talked of her job and told fans that the club was soon to launch a TV channel where highlights and game streaming will be available. Craig Jeffels described his role on the commercial side where he deals with sponsorship and match day corporate hospitality. He is pleased to have got more local businesses involved with pitch side advertising, although he found it hard to attract multi national companies. He had talked to Xscape and built a good relationship which resulted in the new Tigers superstore. Axiom were getting involved with the new Tigers TV venture. Andy Lynch is now the new club welfare manager and he explained that his role covers all aspects of player welfare on and off the field. His main priority is to make sure the players are in the right state of mind to play the physically tough and mentally challenging RL game. After retiring from the game last season he said that he was enjoying his new role at the club. Groundsman of the year Stuart Vause explained how different it was at the club now compared to 13 years ago when he started and the club did not have any specialist equipment to care for the pitches. The wet weather had made it difficult so far this year and he was looking forward to warmer weather and a return seeing the pitches in better condition. Other questions answered included the club changing to a card system for season tickets to combat forgery and lapsed direct debits and sales at the new Xscape shop exceeding expectations. With 95 CTSC members attending the evening made £314.50 on the night. The next CTSC event is a race night, sponsored by Faye’s Sandwich Bar, taking place on Friday, April 13 at the George V WMC. Tickets are £4 adults, £2.50 U16s, with the price including pie and peas. Doors open at 7pm with first race at 7.45pm and last at 10pm. Everyone is welcome and Tigers players will be in attendance. Tickets are available from the Tigers Den, Tigers Superstore Xscape, George V WMC, Tiger bar at the forthcoming Warrington game.